I had a DMV appointment the other day (boooo! But, yay new picture on my license!). After the DMV I decided to stop at the farmer’s market that’s just next door. A little treat for myself after all that bureaucracy. It’s a small farmer’s market. But I like the way it’s set up. The vendors selling pre-made items are on one side and the ag (farmers) are on the other side. It makes it easy to look at the fresh produce. I got some lovely fresh winter veggies, greens, and herbs. I also bought a wonderful avocado honey from the Bee Ladies. mmmmmmm, honey. I decided to make a salad with the beets and spinach. I’m calling it the farmer’s market salad because, well, it came from the farmer’s market. I also tried making a new salad dressing. Caramelized Onion – Buttermilk Dressing. Sounds lovely doesn’t it? Unfortunately, I can’t say that it was. It was too thick and too vinegary. I’m just not happy with it, and it’ll take a lot of work to perfect. So, I recommend sticking with my tried and true favorite for this salad: Sweet and Soy Dressing. To peel a beet or not to peel a beet. That is the question. Well, I don’t peel. I roast them whole and eat them with the skin on. The skins turn soft after roasting. Now, I have found that the smaller beets seem to have thinner skins and are better unpeeled. If your beets are larger you may need to peel them. You can peel before roasting with a veggie peeler, but this makes a big mess with beet juice everywhere. Or, you can roast them with the skins on, and after cooling their skins will slip right off. It’s your choice; this is just how I do it. Beets are like candy! At least they are to me. They’re sweet and full of flavor and just plain awesome. And, they’re really good for you. They’re high in folate, fiber, the phytonutrients called betalains, and they’re low in calories. Read more about their health benefits at World’s Healthiest Foods. This is a great winter salad. The walnuts add crunch and nutrients with their nutty, slightly bitter flavor. Lentils, one of my favorite vegan proteins, are really tasty and high in nutritional value. And, you know I’d put avocado with its buttery creaminess on just about anything! The flavors go so well with the sweet beets; all melding together to get bites of crunchy, creamy, bitter, sweet, and yummy! Place cleaned and prepped beets in a roasting pan, baking dish, or in a cast iron skillet. Drizzle with a little olive oil, sprinkle with salt, and toss to coat. Place the pan in the oven, and roast until the beets are fork tender, about 60 minutes if the beets are small or medium in size. If they’re large, the roasting process may take longer. Carefully take roasted beets out of the oven, and set aside to cool. Place a couple of big handfuls of spinach in a big salad bowl. Sprinkle on shredded carrot. 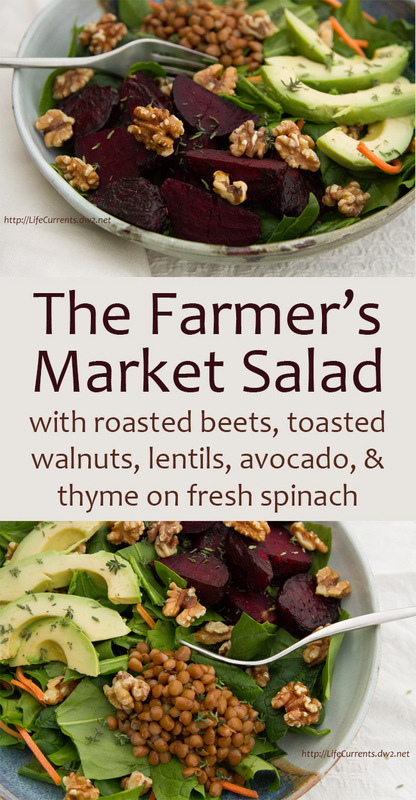 Top with lentils, roasted beets, avocado slices, toasted walnuts, fresh thyme, and dressing. Enjoy! *I had leftover cooked lentils in the fridge. You may use canned lentils for ease. Or, if you’d like to cook your own from dried, they’re really easy. It’s a two to one ratio. Two parts water to one part lentils. Thoroughly rinse dried lentils under running water. Place lentils in a saucepan and pour in the water. Bring the water to a boil over medium-high heat, then reduce heat to a simmer. Cook, uncovered, until lentils are tender and no longer crunchy, about 20-30 minutes, adding water as needed to make sure the lentils are barely covered. Strain the lentils. Add salt if desired. **To toast walnuts in the oven, spread nuts on a baking sheet. Bake at 350° F, stirring occasionally, for about 10 to 15 minutes. I actually put mine in the oven while the beets were roasting. If you do this watch them carefully as the temp is higher than 350°. I simply love this salad! So colorful and healthy. Great pictures too!